Text Compare compares all kinds of text files such as ini, txt, html and xml files. Tiny at 107kb installed. Files can be dragged and dropped onto the interface. Uses NET 4.0 framework, otherwise, appears to be portable. 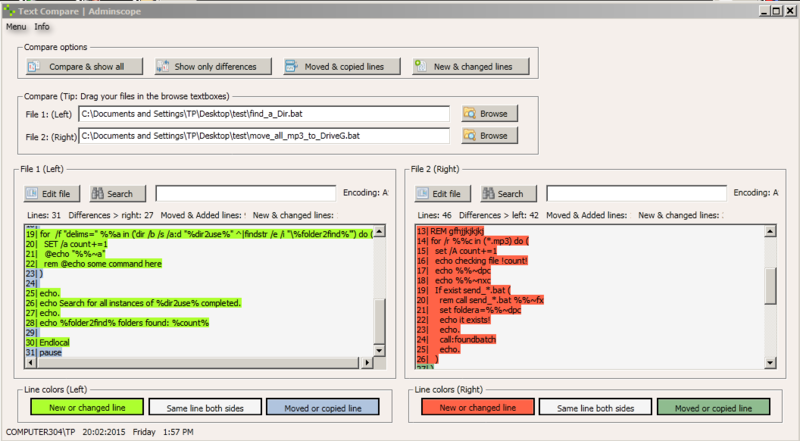 – Quickly filter new lines, modified lines, copied lines and moved lines. – Detect textfile encoding differences. – Mark different lines by color. – Show counters of new, moved and copied lines. – Show encoding format of the selected files. – Supports drag & drop of files within the GUI. – Open your files directly from the GUI to edit it with a text editor. – Different comparing methods to show only the differences between the text files, or only show new & changed lines or moved & copied lines. Last edited by TP109 on Sat May 16, 2015 9:40 pm, edited 1 time in total. "The program does not save settings to disk or registry. It can be used portable from every location." No, go ahead and use it. I already checked it before posting. Slightly off-topic, I'm looking for a text compare app that doesn't require the files being saved first before being able to compare the differences. This app and TextDiff (which is listed in TPFC) both do not handle this. Cool, thanks to you and TP109 and Baas for testing. You're right. It launches Windows Presentation Foundation Font Cache 4.0.0.0 and it doesn't terminate on exit of the program. I submitted a bug report to the developer about the Windows Presentation Foundation Font Cache 4.0.0.0 process. Thanks billon. Your discovery helped me improve my testing procedure under sandbox. TP109 wrote: I submitted a bug report to the developer about the Windows Presentation Foundation Font Cache 4.0.0.0 process. I think it isn't a bug. As a .NET program, Text Compare likely uses Windows Presentation Foundation. Is makes sense that Windows Presentation Foundation Font Cache starts when a WPF program is launched. Apparently, this service was not running (stopped) on my test machine.